Editor's note: This story was updated on April 5 to include additional information about the creation of La Fe Preparatory School. CHARLESTON, S.C. — Former U.S. Rep. Beto O'Rourke stood on a table at a brewery here on a recent Friday night fielding questions from inquisitive Democrats giving him their first once-over. For a few women at the front of the effusive crowd, one issue was at the top of their minds: school choice. O’Rourke described the idea long touted by conservatives as a threat. “We will not allow our public tax dollars to be taken from our classrooms and sent to private schools,” he said. His answer took three full minutes, during which he addressed his support for increasing teacher pay and implementing universal pre-kindergarten, as well as his aversion to standardized testing. But one aspect of the American educational system went unmentioned: charter schools. Where O’Rourke stands on charter schools is a question growing increasingly louder among many Democratic groups, with some hackles raised in particular over O’Rourke’s wife, Amy, who started a charter school in El Paso 13 years ago and now works for an organization that backs the expansion of charter schools in the region. It is a fairly narrow issue in Democratic circles. Yet it has the potential to strike tripwires for O'Rourke's presidential bid, including his relationships with teachers unions and advocates, and bring up questions over whether the former El Paso congressman is too centrist for the current Democratic electorate. Charter schools are one of the biggest lightning rods of American education. They are publicly funded, privately run institutions, created to have more freedom from government regulations than traditional public schools. Advocates argue charter schools are a desperately needed alternative in communities where the traditional school system has failed. Opponents charge that charters siphon funding from other public schools and use their increased flexibility to avoid protecting their teachers and most vulnerable students. Amy O'Rourke's original foray into the world of charter schools — while her husband was on the El Paso City Council — was largely successful and did not draw much controversy at the time, according to public records and several people involved. 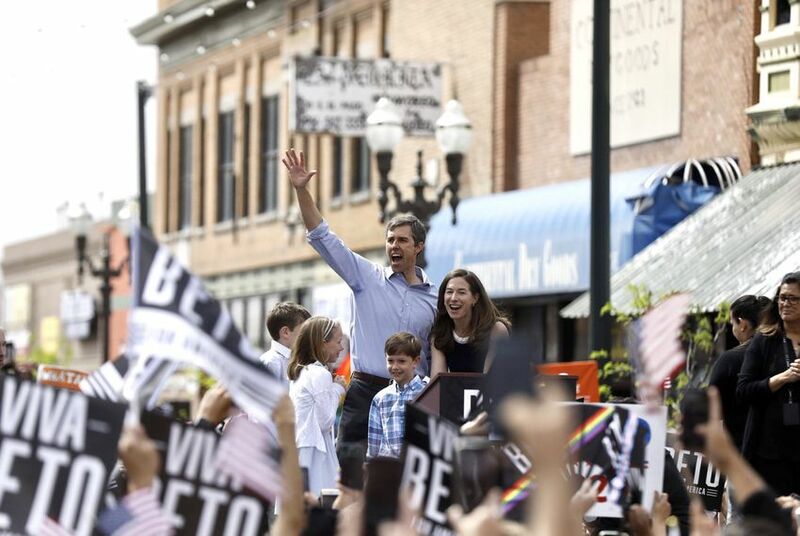 Yet the politics of such endeavors have shifted dramatically in recent years, particularly in states that could prove critical in O'Rourke's bid for his party's nomination. Amy O’Rourke was 25 and had been married for less than a year when she began filing paperwork for La Fe Preparatory School on behalf of Salvador Balcorta, the chief executive officer of the La Fe Community Development Corp. The school was to be aligned with the nonprofit, which provides health care, housing and other services to needy El Pasoans and where Amy O'Rourke was education development director. Prior to her time at the nonprofit, she had spent a year teaching at a local private school and another year teaching in Guatemala. She had a degree in psychology from Williams College and no education certification from the state. Such a background is not unusual in the sphere of charter schools, according to interviews with education policy experts. The O’Rourkes — who are worth millions, in large part through their parents' successful business ventures — send their children to a traditional public school. In her application to the Texas Education Agency, Amy O'Rourke envisioned a new school serving pre-kindergarten through eighth grade where half of the students were fluent in English while the other half were fluent in Spanish. Classes would be taught in both languages to an almost completely Hispanic student population. It would be located in Segundo Barrio, an El Paso neighborhood where many Mexican immigrants settle when they first arrive in the country. "The local school district has failed to create an educational system that can generate true success for all students in the community," she wrote in her application in 2006. "The public schools are facing the unfortunate struggle of determining the best approach to address language barriers in the Segundo Barrio." It was the first school in El Paso to take the dual language approach. The notion caught on: Nine El Paso elementary schools are now dual language public schools. Carlos Gallinar was the director for community and economic development at the La Fe Community Development Corporation from 2005 to 2010 and worked side by side with Amy O'Rourke as she navigated the process of opening La Fe Prep. "The educational standards that they were given by the local school district weren’t up to par," he said of the children of Segundo Barrio. Amy O'Rourke, he said, believed that "we have to address this, and perhaps the best way is to establish a wholly new educational model through this new school." Ultimately, nearly all of the students qualified for free lunches and were from families that had recently arrived in the United States. "Over the five years she and I worked together, I saw her temperament and I saw her discipline," Gallinar said. At the same time she was filing her application for the school, other members of Amy O'Rourke's family were also focused on Segundo Barrio. Her father is Bill Sanders, one of the country's most prominent real estate investors. Both he and her new husband were in the middle of a bruising political fight to revitalize the neighborhood that year. Another board member for the organization is El Paso businessman Woody Hunt, one of the most prominent political donors in the state. Although he is mostly known as a backer of Republicans, he has donated to Democrats in the past, including Beto O’Rourke. "The congressman's wife is not him"
Nearly a decade and a half since Amy O'Rourke started the paperwork for La Fe Prep, her husband is a presidential candidate whose stump speech calls for increased teacher pay and a strong aversion to private school vouchers. As for where he stands on charter schools? "He has made it clear that our focus should be on, and our taxpayer funds should go towards, public school classrooms where the overwhelming majority of American students attend," said O'Rourke spokesman Chris Evans. "He believes that we should be investing in getting our public school teachers the resources they need to help their diverse set of students succeed. "Beto believes that any public charter schools that exist across the country should deliver for students, be respectful of teachers, and have comprehensive oversight and accountability to the taxpayer." There is no monolithic Democratic dictum on charter schools. Half the time, advocates cannot even agree on the semantics of how to describe them or their impact on public education. “I think there’s a range of views on every education policy, and charter schools are no exception,” said Scott Sargrad, a former Obama education official who is now a vice president at the Center for American Progress, a liberal think tank that supports some charter schools. Other Democrats interviewed bristled at the notion that Amy O’Rourke’s career in education could emerge as a campaign issue. The notion of any candidate bringing another candidate’s spouse into a political fight was dismissed as an unnecessary personal escalation into a primary that, so far, has been relatively genteel and focused on ousting President Donald Trump. Over the years, Beto O'Rourke has drawn some prominent support from the public education world. The National Education Association, the nation's largest labor union, gave O'Rourke its highest ratings on its two most recent Congressional report cards. In his 2018 campaign against U.S. Sen. Ted Cruz — a man who has frequently called school choice the "civil rights issue of the 21st century" — NEA and the affiliated Texas State Teachers Association backed O'Rourke. Even so, the specifics of O’Rourke’s charter school views have piqued the curiosity of some Democrats. American Federation of Teachers President Randi Weingarten recently traveled to Texas to discuss the issue with both O'Rourkes, according to the Intercept. She declined to elaborate on her impressions about the candidate's views on charter schools but spoke positively about the meeting. But another high-profile player in education is far more blunt. The Network for Public Education, an anti-charter organization, has collected past O’Rourke statements on charter schools on its website and given him an “F” rating on the issue. The group also gave O'Rourke negative marks for his "affiliations" with the charter movement, citing his wife. One of NPE’s founders is a bold-faced name in education politics: Diane Ravitch, a former U.S. assistant secretary of education. NPE has closely monitored every word O'Rourke and other presidential candidates have uttered on charter schools and every relevant vote they've taken. In 2016, O'Rourke, voted against a congressional proposal to implement a school voucher program in Washington, D.C. While the group agreed with his vote, it found his reasoning problematic. "I voted against this bill because I think we should allow the District of Columbia to invest the amount included in this bill in the public education system, including teacher training and expanding other proven educational models such as charter schools," O'Rourke wrote in a post on Medium later that year. Similarly, O'Rourke backed the federal "Every Student Succeeds Act," the country's main education law for public schools and a revamp of President George W. Bush's No Child Left Behind policies. The legislation softened, and Weingarten's group, AFT, cautiously engaged with the legislative process to strengthen oversight of charters and ultimately supported the bill. "The AFT worked to secure language to ensure charters are educating the same populations as traditional public schools; to strengthen the standards that charters need to meet, with a focus on fiscal oversight; and to increase parental involvement to help ensure charter schools are locally grown and not forced on communities," an AFT memo stated at the time. But again, Ravitch's group took issue with O'Rourke's logic when he wrote that the legislation will "promote high-quality choices for parents by improving and investing in new charter school models." Other presidential candidates' positions on charter schools are equally nuanced. U.S. Sen. Kamala Harris of California has long opposed charter schools. But U.S. Sen. Elizabeth Warren of Massachusetts once backed charter schools before she came out strongly in 2016 against a measure to expand charters in her home state. And in his previous job as Newark mayor, U.S. Sen. Cory Booker of New Jersey made a dramatic 2010 appearance on The Oprah Winfrey Show alongside then-Gov. Chris Christie to announce a stunning shakeup: Facebook CEO Mark Zuckerberg donated $100 million to the city's school system. The project eventually resulted in a major expansion in charter schools, according to NPR. As the Booker tact shows, charter schools were somewhat en vogue within Democratic politics earlier this decade. That same year, the documentary Waiting for Superman followed the story of several families attempting to gain admittance to charter schools and caught the interest of Hollywood’s elite. And President Barack Obama’s first education secretary was a prominent supporter of the movement. Things have changed, though. In part, some liberals point to the deep unpopularity among Democrats of current Secretary of Education Betsy DeVos, one of the country’s most prominent advocates of charter school expansion and private school vouchers. Going forward in the presidential nomination fight, some Democratic operatives suggested that the issue will not matter in the Iowa caucuses, the first-in-the-nation contest for Democratic candidates. They anticipate there will simply be other overriding issues and the sense of each campaign's momentum preventing Iowa caucus-goers from vetoing O’Rourke on charter schools alone. But after Iowa, the primary will shift to states where teachers unions are far more powerful — a political dynamic O'Rourke never had to face during his years running for office in Texas. And should the primaries extend far beyond Iowa without a clear winner, O'Rourke could find himself in a knife fight in which every delegate will matter. In early March, Californians will head to the polls amid the Super Tuesday glut of primaries that will also include Texas. The Golden State was once at the forefront of the charter movement, but a backlash has set in. Earlier this year, Los Angeles teachers went on strike and successfully stemmed the growth of charters in the city. And then there is New York, whose primary date remains up in the air. Teachers unions are far more organized there than in Texas. And the mere mention of Ravitch's name is enough to make the state's politicians quake. The tide has turned in that state as well. Aliyya Swaby and Gabe Schneider contributed to this report. Correction: An earlier version of this story misidentified the name of the federal education law, the Every Student Succeeds Act.